This is the day we remember that Jesus died on a cross. The day He traded His perfection for our sin and when He was abandoned by those closest to Him. It was our desperate need that drove Him to the cross. Our incurable disease of sin laid down a debt so huge that only the death of God could cover the bill. It was the only way. And somehow we forget the gravity of the situation. We pretend like our sins are something to laugh at. 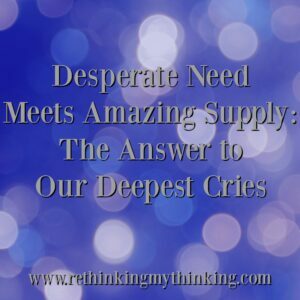 But Jesus saw our desperate need and supplied us with the solution: His death. His death paid the debt between God and ourselves. His death tells us we are loved and valued…we are worth dying for. His sacrifice shows us that we are significant even when it feels like no one sees what we do. Jesus died that we may live knowing we are loved, valued, significant. Yet we seek answers to our deepest cries in other places. We seek to be recognized for our hard work or we seek love in places God never intended. Jesus died for us knowing our hypocrisy and fickle nature. He died so we will one day live with Him in eternity. O, what a day that will be! Father I admit I often seek my value, significance, and love apart from You. But Jesus proved He loves me, values me, and labels me significant by the sacrifice He made on the cross. Lord help me to give my whole life over to You that I may live for You and not myself. May Your glory be seen. Thank You Jesus. Thank You! This entry was posted in Rethinking Christian Life and tagged am I loved, Does God love me?, love, Need, significance, sin. Bookmark the permalink.